I confess, I’m a bit of a hopeless romantic and I do love Valentine’s Day. That said, I thought I would share one of my favorite stories about a scrappy person who was proactive and found a way to gracefully encourage Cupid’s arrow to fly in their direction. It’s fun and a little inspiring—especially because it’s true! 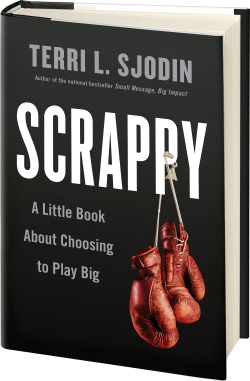 While many of the stories and illustrations in my latest book Scrappy: A Little Book About Choosing to Play Big, are focused on the professional arena, I have made an effort to show how getting scrappy can also apply to your personal life. 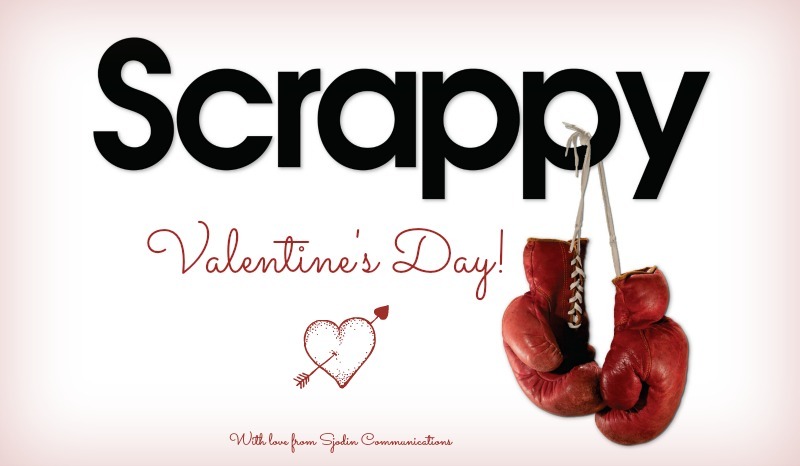 Anyone can be scrappy. It’s a choice to play big, or at least big for you. It’s what you do when you are all in and ready to put your tush (or your heart) on the line. In the context of dating, getting scrappy becomes a playful notion, but still requires serious effort. After all, you not only want to change your circumstances, you want to do it in a scrappy and classy way. Consider the example of boutique owner Jennifer Matthey Riker who experienced life changing results after she decided to get scrappy and play big with her dating life. At the age of 36, Riker was a self-described “serial entrepreneur” and single with no children, but still eager to get married and start a family. She was also sensitive to the fact that her biological time clock was ticking. As a marketing consultant with her own business, she had plenty of freedom but wasn’t meeting many eligible men because she worked from home and most of her clients were on the East Coast. Though she gave online dating a fair shake, she found it too time consuming and not really suited to her personality. So Riker started brainstorming, trying to pinpoint the best places to go to meet the right kinds of guys. She had a specific goal—to meet a man who also wanted the same things she did. She eventually decided she needed to place herself in a setting where she could meet men naturally, so she took a sales position at Nordstrom working two nights a week in the men’s department. After only two weeks, Jennifer said, “a gorgeous guy walked into the store and our eyes met across racks of clothes. He made up an excuse about needing a white shirt, and the rest is history.” And, yes, for all you romantics, Riker and her husband have been married for over 14 years and have two beautiful children! Another example of a scrappy dating strategy is one that my colleague Dr. Terry Paulsen shared with me about a man who loved dogs and wanted a partner who felt the same way. With that in mind, every Saturday this guy would go to the pound and wait as people came to bring in puppies that needed homes. He would ask if he could take them to Balboa Park in the San Fernando Valley and see if he could find them a home. He would put out a blanket, a sign for free puppies and people would stop. The best part? Many of those people were attractive women, which was kind of the point. Not only did he find homes for the dogs, he always found a date for Saturday night (that is, of course, until he met his wife who put an end to all that). So this Valentine’s Day, maybe it’s time to engage in a creative effort to make something amazing happen in your (love) life – whether you want to put a little spark in the relationship you already have, or you’re on a quest for a new romance. Scrappy people see the challenges before them and find a new path to extraordinary results. They understand that in today’s market (or dating scene) you need more than just a dream and a willingness to show up and work hard. Sometimes, to beat the competition, you have to make something happen to be memorable and stand out from the masses. Remember, whether you’re a sales executive with big dreams but a small budget or a single gal or guy looking to meet a great person to date, the fastest way to get what you want might be to get scrappy!